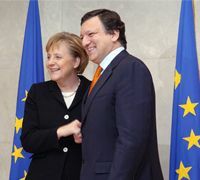 The Wall Street Journal reports today yet another example of how continental politicians hope to use the EU as a means of enforcing their economically disastrous policies across the whole continent. Each individual EU country knows that their statist schemes will retard economic growth, and send investors, entrepreneurs and capital to freer countries where markets are allowed to flourish and productive elements are welcome. So to avoid "damaging" competition between EU countries, politicians from countries with uncompetitive regulative and tax system want to force all EU countries down to their standard. This is why certain EU politicians wanted to enforce harmonised taxes across whole EU, so that more competitive countries like Britain would be lumbered with outrageously high tax rates, and thus reducing our relative attractiveness to investors. This time it is Germany wishing to enforce their strict controls over foreign ownership of German capital. Merkel knows that intervening in the free flow of capital will send investors away from Germany, so she says it is only "fair" and "responsible" to enforce these policies across the EU. If such intervention made any sort of economic sense then why only restrict ownership of non-EU groups, why not stop French companies from buying German stocks? Indeed, if restricting ownership made any sense at all why not stop companies from one German region buying companies based in another German region. Economic laws do not follow artificial man-made borders. It is thus unsurprising that countries most open to foreign investment are those countries that are reaping the biggest gains from globalisation; seeing higher growth, lower unemployment and better allocation of resources. If this undeniable economic logic does not convince Germany, then they are free to continue to shoot themselves in the foot by introducing populist protectionist measures, however, Germany should certainly not be enforcing its stupidity across the whole EU. Germany should not be able to undermine the foundations on which British prosperity is built. Ultimately, this is just further evidence of how far apart Britain’s economic outlook is from continental Europe’s, and so further evidence of our need to reconsider elements of our relationship with Europe.